Think of a young nun and a dashing French count. Think seduction and then complete and utter abandonment. She is devastated. She writes to him - at first with forlorn hope, then with a growing realisation that he is never coming back. Finally, she accepts life must go on without him. There are just three letters, but when they were published in 1669 they created a literary sensation. Readers were shocked, titillated and couldn't get enough of them. The Naughty Nun - Sister Mariana Alcoforado came from a comfortably well off family. It may be that she met Count Chamilly through her brother as both men were in the military. 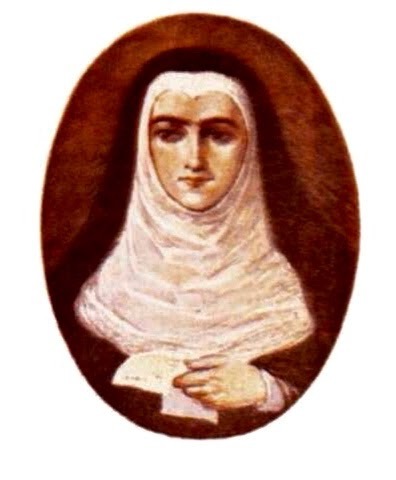 Sister Mariana Alcoforado was 25 and a resident of Beja's Convento de Nossa Senhora da Conceição when she met her count. Today, the convent and its neighbouring church house a regional museum. But up on the first floor, past the Roman coin collection and the Roman stonework, there is a window with a terracotta grill. It is from here that Mariana first set eyes on Count Chamilly. 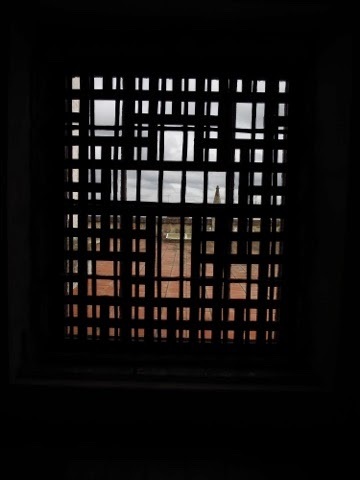 The first floor window through which Mariana first saw Count Chamilly. What followed is not clear, although it's obvious the Count charmed Mariana and before long found his way into her bed. How he managed to steal his way into the convent is hard to imagine - we made enough noise walking on the stone floors without wearing clumpy riding boots. And surely he couldn't have left his boots outside on the front door step where they might have been spotted by the Mother Superior doing her nightly rounds. Perhaps he carried them in one hand, a candle in the other and a single stemmed red rose in his teeth. However the two carried out their liaison it ended in tears. Afterwards she wrote "... I am furiously jealous of all that gives you pleasure, and comes near to your heart and fancy in France. I know not why I write to you. I perceive that you will only pity me, and I wish for none of your pity. I hate myself when I look back on all that I have sacrificed for you. I have lost my honour. I have exposed myself to the anger of my parents, to all the severity of the laws of this country against religious, and finally to your ingratitude, which has seemed to me the greatest of all my evils." Oh dear. But the terrible romance lives on in The Letters of a Portuguese Nun, available free on line. According to one guidebook, the letters were the Fifty Shades of Grey of its day. But before anyone is tempted to rush off for the download, here's another sample. "I know not what I am, or what I do, or what I wish for. I am torn asunder by a thousand contrary emotions. Can a more deplorable state be imagined? I love you to distraction, and therefore I spare you sufficiently not to dare to wish that the same emotions would trouble you. I should kill myself or die of grief without were I to be assured that you were never having any rest, that your life was as anxious and disturbed as mine...."
And so Mariana goes on. It makes for a pretty depressing read. But who knows, when they get round to the film they might be able to do something with it. Judy (the Stoker): "I just put on your hat and thought what a wonderful life." Judy: "Some people go searching for Rembrandts, we go searching for out of the way campsites." Judy: "I must have had more wine than I thought last night. I blew up my (air) mattress and it was quite slobbery." 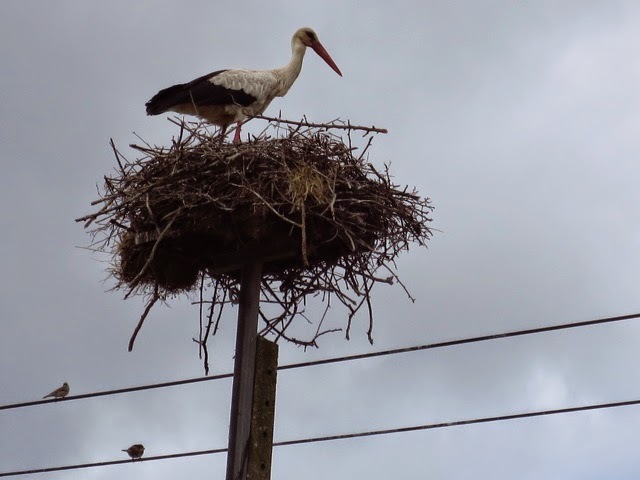 Judy: "That stork is going to think you're stalking it with that camera." Judy: "Oh, I can smell my armpits. A little washing wouldn't go astray." It was high noon when we rode into town. 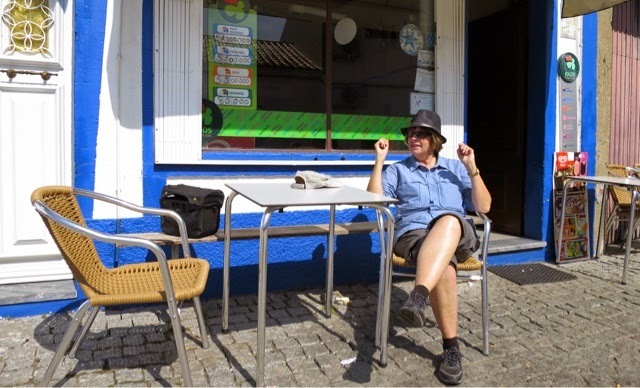 Astride a hilltop, Odivelas was ablaze under a hot sun in a blue sky. People were already seeking shade, although the day would get warmer yet. In the square, six old men commanded a park bench each. They ignored us - not even an eyelid flickered. We dismounted and I tethered the Beast of Burden alongside a whitewashed wall. High noon in Odivelas and nothing stirs. Suddenly, a flurry of movement. A man sitting outside a tiny bar nodded in our direction. "Boa tarde", we murmured in reply. He had a companion. It was a man with a long cane which he tapped incessantly on the ground. Maybe he was blind. Maybe he wasn't. "Those trees are wearing jackets", Judy said. She was right. Weird. She took the camera and wandered over to the square, the six old men day dreaming of times past and the trees with jackets. She came back. "They're crocheted or knitted or something. Why would anyone do that?" We peered into the bar hoping for coffee but it was too dark inside to see. There was a cafe a few metres further on. The outdoor seats were in the hot sun, but the breeze on the bike had been cool. We were served bread and what may have been pork crackling, along with our coffee galão. It was good. Coffee galão with pork crackling. The husband served us, but it wasn't long before his wife came outside to study the strangers with the strange bike. We tried to converse but it was hopeless. We left town none the wiser about the colourful jackets, but who cares? The cycling was brilliant. 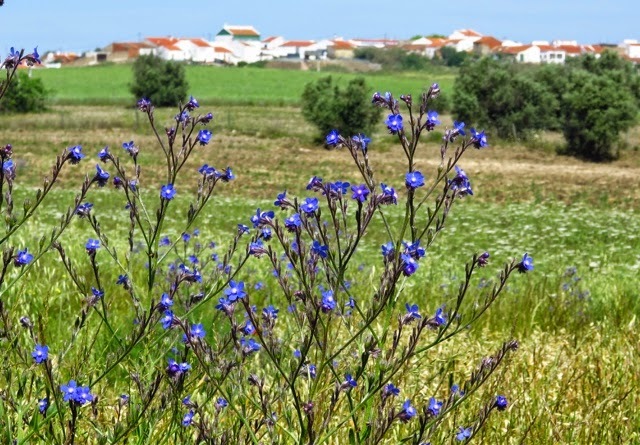 For three days we have pedalled east across the Alentejo - the central soul of Portugal. 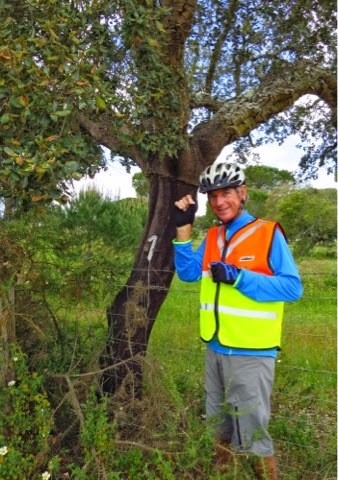 Gentle, rolling countryside with scrubland has given way to our first cork trees - at times stretching as far as the eye can see, then wheat, olives and a few cattle. Our first cork trees. The Alentejo region provides half the world's cork, but demand is falling as winemakers move away for cork stoppers in favour of screw caps. Wild flowers and the hilltop town of Odivelas. 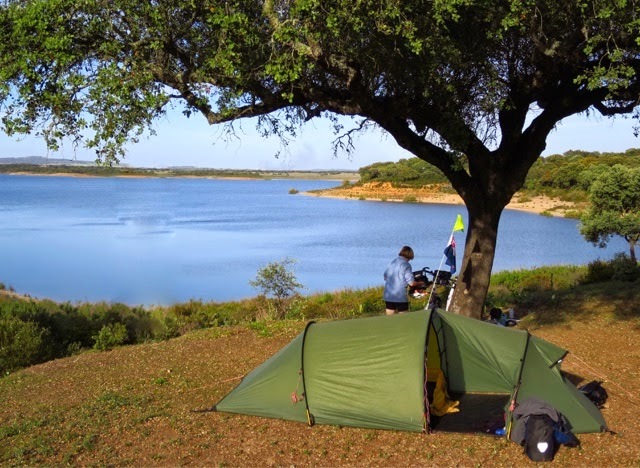 There has been little traffic, and a couple of campgrounds right when we needed them, one beside a man made lake at Barragem de Odivelas. That night we watched the light fade as a long way across the water, the lights of the village of Torrao came on. Lakeside campsite at Barragem de Odivelas. 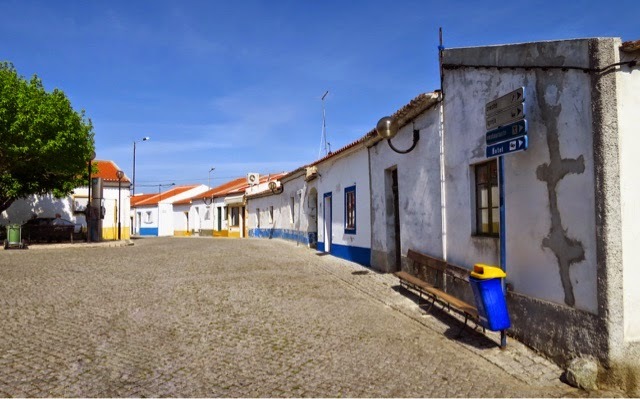 Now we are in Beja, the main town of the Baixa (Lower) Alentejo and it is 25th April - a national holiday to celebrate the 1974 revolution. Getting a handle on the political changes since then has not been easy. Perhaps the most interesting conversation was with a middle aged woman in the Tourist Information Office here. 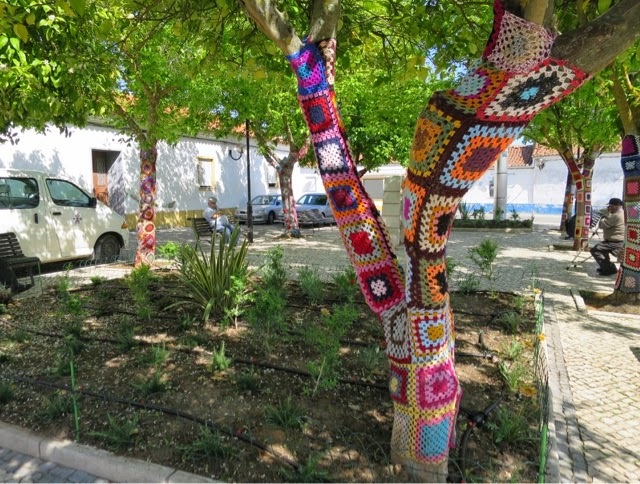 "The Communists still have influence here in Alentejo," she said. "And they like to claim April 25th as their own. But it's not. It belongs to all Portuguese people." She would not be celebrating, she said. She was a democrat and she believed in free elections. But the dictator Salazar was not all bad - though certainly the repression under his regime was wrong. Now Portugal was suffering for its membership of the EU - having to pay back loans for all the money it had borrowed. And under the old regime, there were people willing to work in the fields. Now everyone had university degrees and people came from Romania to harvest the crops. Our conversation was interrupted by others seeking information. "This is just my view," she said as she turned away. This afternoon we stumbled across a band practice. Vozes do Alentejo were on stage readying for a performance to mark 25th April. We couldn't understand a word, but they sang in beautiful harmony and we were moved by what felt like songs of longing. Up in that hilltop town, those old men may have been lost in the past. But here the voices were full of sorrow and joy and hope for the future. 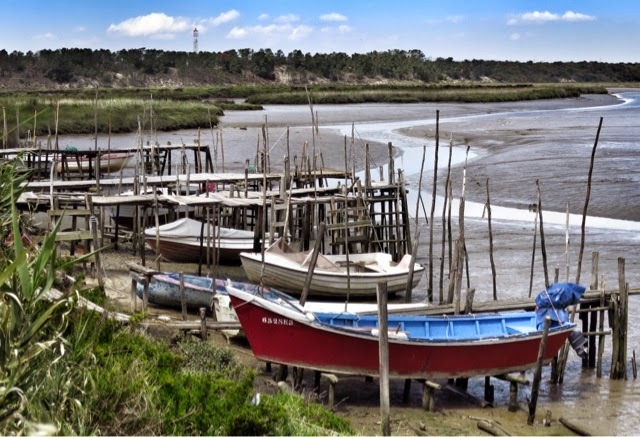 Inland from Setubal - low lying landscape and easy cycling. It would be nice to say we have stayed longer than planned in Lisbon because we have been having a wild and crazy time - drinking through the the night with new found friends, wallowing in the melancholy tunes of fado, watching the dawn sun pink the roofs of this pretty city before adjoining to a nearby cafe for intellectual and political conversation about Portugal after the dictator Salazar and life as one of the Europe's PIGS. A street where the sun hardly ventures through the windows. Unfortunately, nothing could be further from the truth. I have been in bed for most of a week with a raging sore throat and a cough that was enough to wake the dead. At times, it felt as though death was not far away and that I was in a coffin - our apartment was long and narrow and so dark it felt we were buried underground. The only hint of daylight came from each end - at the rear was something that might be politely called a light shaft, though no direct sunlight reached down it. At the other end was a window in a narrow lane of windows designed as if to ensure sunshine never reached them. Not that I cared much - I just buried myself under the duvet and wondered whether the rising and falling damp would finish me off before the racking cough. Judy did an admirable job as Nurse Yeoman, but after a day or two she began exploring - a bit like a horizontal yo yo that defied gravity to spin further and further away from our apartment. She came back with tales of sights and sounds that finally stirred me. 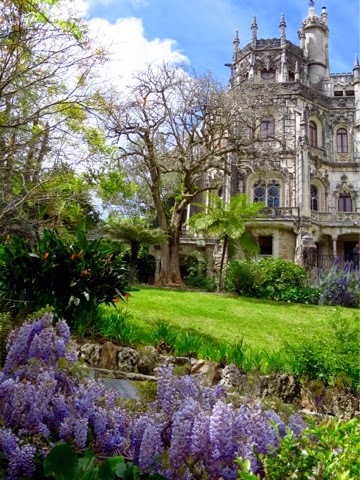 Palace e Quinta da Regaleira in Sintra, a favourite day trip for the residents of Lisbon. We went to the local hospital. I was examined standing up in an emergency ward full of the nearly dead. Eight of them lay on stretchers - all elderly, mostly women. One woman had a terrible purple eye - did she have a fall on a cobblestone street or something worse? A bald headed man displayed an impressive array of scabs all over his scalp. I felt embarrassed standing among these seriously ill and apologised to the doctor for taking up his time. He laughed, handed me a prescription and told us both to go and enjoy Portugal. 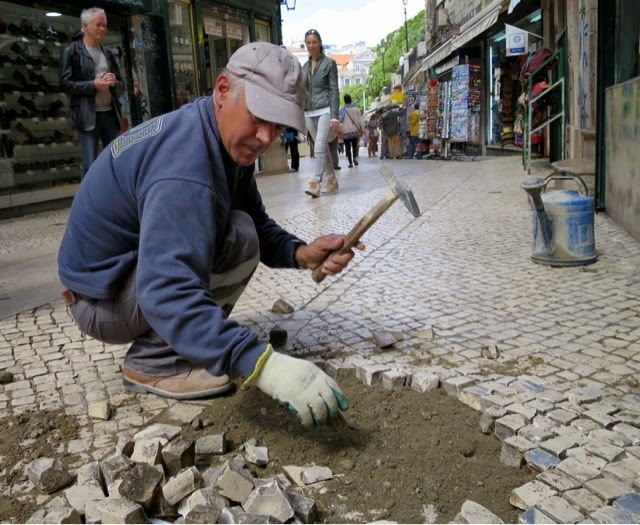 No shortage of work repairing Lisbon's cobbled streets. So we are. 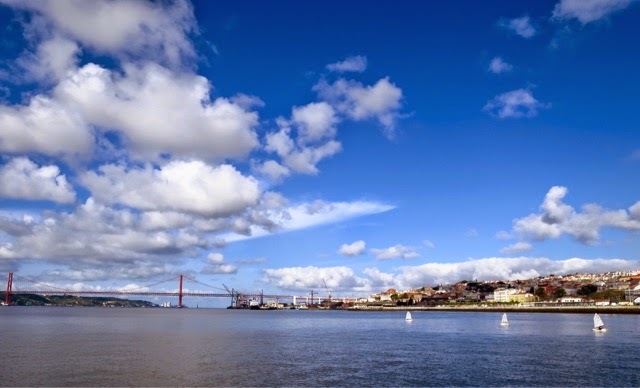 Together we have managed to visit Lisbon's main tourist sites, catch the number 28 tram without getting pick pocketed, visit the fado museum and one dedicated to the history of Portuguese tiles. The latter was not as boring as it sounds. 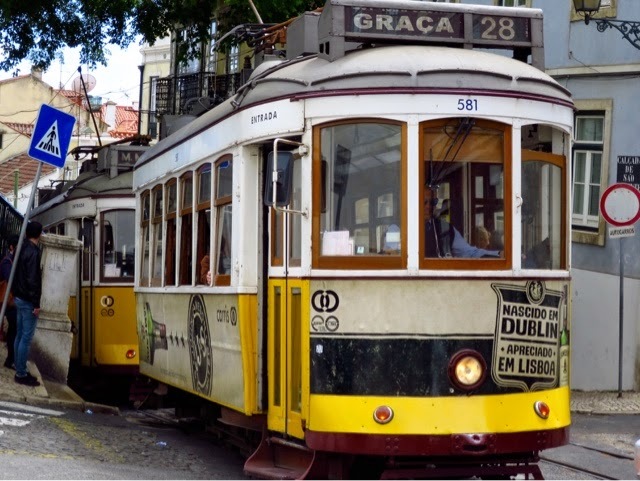 We escaped having our pockets picked on Lisbon's most popular tram, no 28. 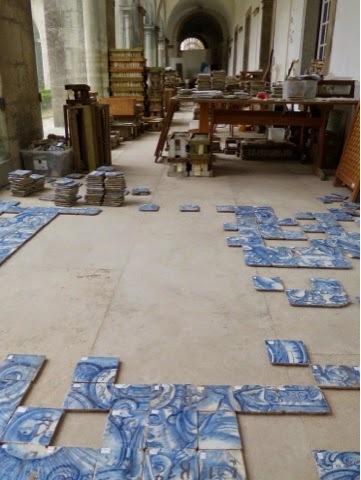 Tile museum and a jig saw for grown ups. 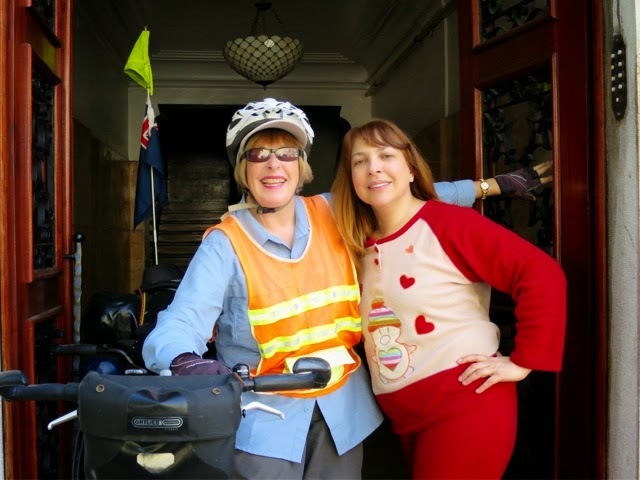 After the coffin experience, we had a delightful stay with Brazilian born Luciana and her mother. 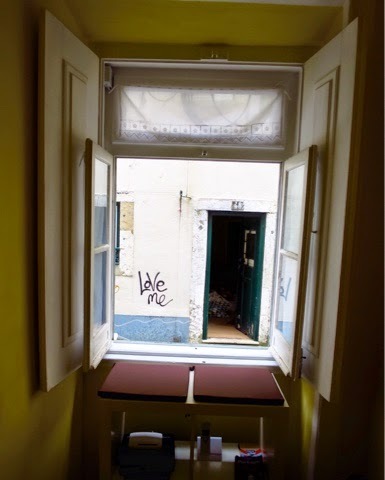 Here Luciana shows off what's in fashion in the bedrooms of Lisbon this spring. 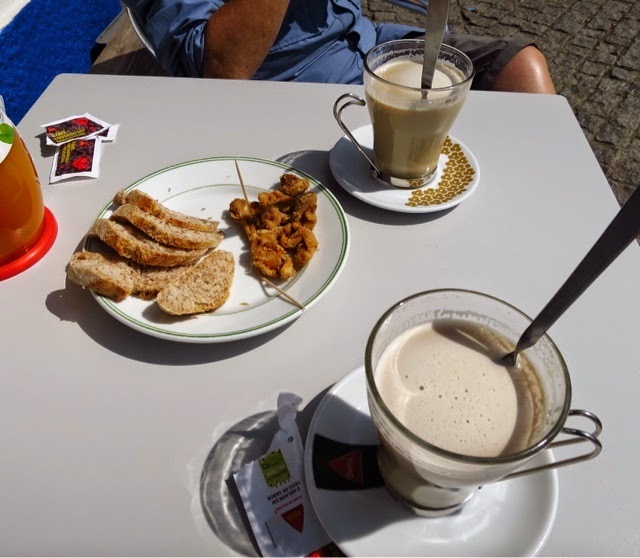 And yesterday we took the opportunity of a quiet Sunday morning to gently ride the tandem to the ferry terminal where we caught a boat across the River Tejo to Cacilhas where we began our riding proper - south to Setúbal on the Atlantic Coast. We left Lisbon by way of a ferry on a quiet Sunday morning. Three little Optimist sailing dinghies were enjoying the light breeze. In the background is a city bridge reminiscent of a (smaller) Golden Gate in San Francisco. We have a plan of sorts. We want to cycle into the interior of Portugal - Alentejo, up to the Douro River and out to Porto. From there, we plan on northern Spain before crossing by ferry to the UK and Ireland. And hopefully we will have a wild and crazy time for at least part of it.